Everest Three High Passes Trek is quite challenging for those intending on crossing 3 most popular Everest high passes above 5000m .The journey begins with a sightseeing day tour to the cultural and religious spots in Kathmandu. Next day morning we will transfer you to domestic airport to catch a flight to Lukla, the access to the Everest region. It will be a -35minute flight enjoying spectacular mountain views. After overnight stay at Phakding we begin our trek the following day passing through lush green farmland, picturesque villages, glistening blue fast flowing rivers, Sagarmatha National Park and Buddhist monasteries. At Namche bazaar you will spend a couple of days to get acclimatized. It is the bustling market town with hotel and restaurants. During your stay at Namche bazaar you will enjoy the awe-inspiring Himalayan mountain sights and will get an opportunity to visit Buddhist monasteries, Sherpa museum. Then, you trek to Thyangboche monastery, a very popular Tibetan Buddhist monastery belong to the Sherpa community. It is situated at the elevation of 3,867 from sea level. This is the largest Buddhist monastery in the Khumbu region of Nepal. At Dingboche (4410m) you will find a cluster of houses set among the high summer grazing pastures of the Khumbu region .One day set aside for rest and acclimatization at Dingboche allows you to explore further and trek Kongma La. After exploring Kala Patthar and Everest Base Camp you will cross over Cho La Pass and continue trek to the Lakes of Gokyo. From Gokyo Peak you will enjoy awe inspiring views of surroundings including Mt. Everest. .From Gokyo we trek to Lungden and cross Renjo La Pass. 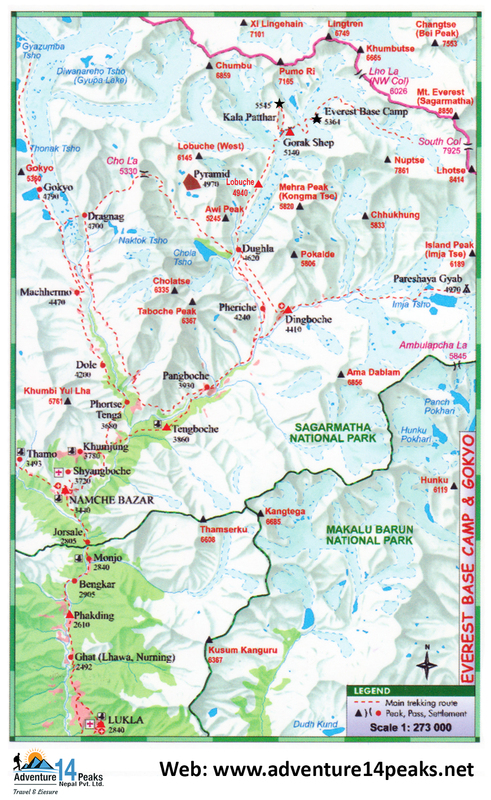 From Thame you will gently descend to Lukla via Namche Bazaar and fly back to Kathmandu. Crossing the three high passes of Kongma La (5535 m) Cho La (5380 m) and Renjo la (5388 m), with the ultimate exploration of Kalapathar (5545m) and Everest Base Camp trek (5365 m) provides the unexpected and unforgettable trekking experience in Nepal. Early morning fabled scenic beauty of Tengboche takes our breath away. The mountain panorama includes ranges of Kangtega, Thamserku, Ama Dablam, Taboche, Kwangde, Tengboche, Lhotse and Nuptse. After snapping pictures, we start the day journey through the trial that follows through Imja Khola upstream. Descending rapidly from the Tengboche meadow to the river bank, the track traverses a deep forest of birch and rhododendron with magnificent views of Ama Dablam, Lhotse-Nuptse ridge. As we reach Deboche, a charming place pangbuche –somare – and to dingbucheOvernight at Dingboche. The journey within the mountains of Nepal comes to an end today! Tapproximately 3 hours before our scheduled flight, a representative of Adventure 14 peaks escorts us to the airport. On our way to home we will have plenty of time to plan our next adventure trip in the wonderful country of Nepal.